With the advent of big data and cloud-scale delivery, companies are racing to deploy cutting-edge services. “Extreme” applications like massive voice and image processing or complex financial analysis modeling that can push storage systems to their limits. Examples of some high visibility solutions include large-scale image pattern recognition applications and financial risk management based on high-speed decision-making. These ground-breaking solutions, made up of very different activities but with similar data storage challenges, create incredible new lines of business representing significant revenue potential. Every day we see more and more mainstream enterprises exploring similar “extreme service” opportunities. But when enterprise IT data centers take stock of what it is required to host and deliver these new services, it quickly becomes apparent that traditional clustered and even scale-out file systems—the kind that most enterprise data centers (or cloud providers) have racks and racks of—simply can’t handle the performance requirements. There are already great enterprise storage solutions for applications that need either raw throughput, high capacity, parallel access, low latency or high availability—maybe even for two or three of those at a time. But when an “extreme” application needs all of those requirements at the same time, only supercomputing type storage in the form of parallel file systems provides a functional solution. The problem is that most commercial enterprises simply can’t afford or risk basing a line of business on an expensive research project. 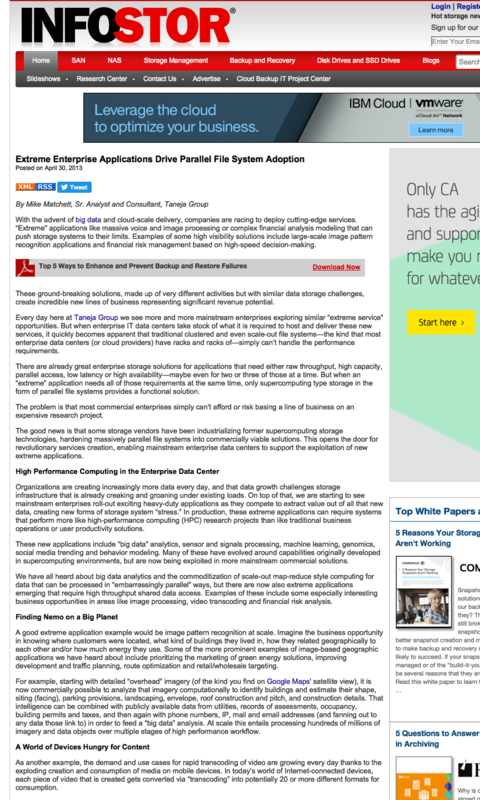 The good news is that some storage vendors have been industrializing former supercomputing storage technologies, hardening massively parallel file systems into commercially viable solutions. This opens the door for revolutionary services creation, enabling mainstream enterprise data centers to support the exploitation of new extreme applications. 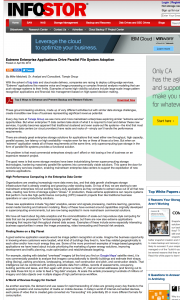 This entry was posted in Published Articles and tagged Hadoop, HPC, Infostor, Lustre, Storage, Taneja Group by Mike. Bookmark the permalink.